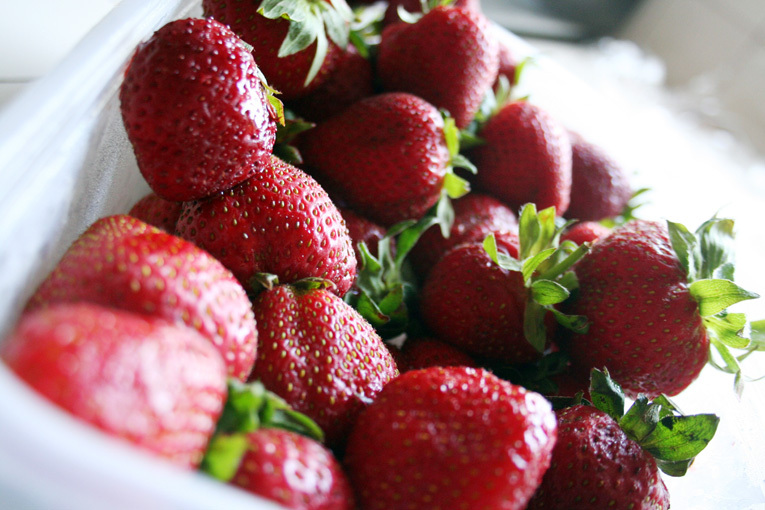 My newest of neighbors kindly brought over a large batch of strawberries that she admittedly couldn't finish between her and her husband. Several recipes came to mind as I thought about using the fruit before it went to spoil. A very simple and longer-lasting item was jam; if using a sterilized bottling process, it can last to about one year on the shelf! The simple jam could be used in a later recipe and for my own enjoyment on breakfast toast, peanut butter and jelly sandwiches, etc. so it was clear that making this was a win-win. The recipe contains minimal ingredients and is something I've made since I was a kid for fruit pies and toppings. Enjoy! Set a small plate in the freezer for later 'Jelling' test. Remove stems. 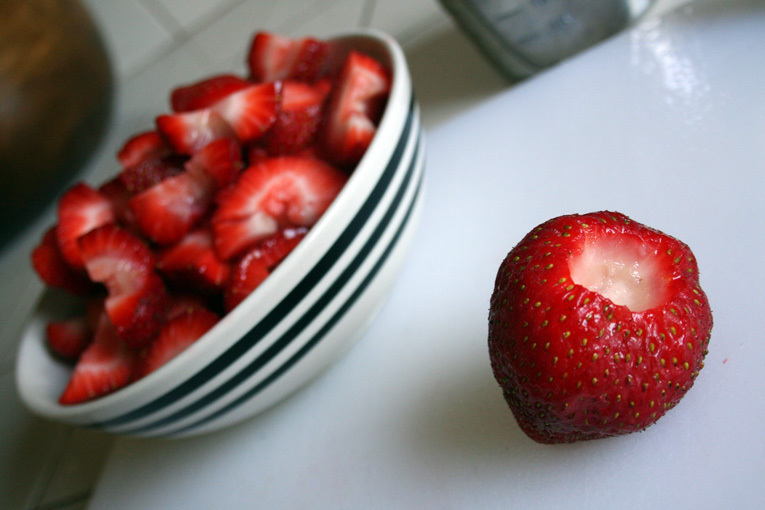 Slice strawberries into quarters and set aside. 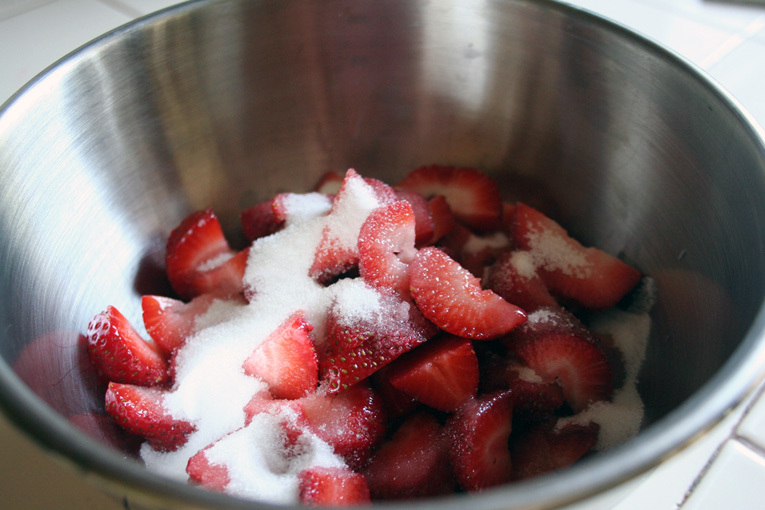 Mix Sugar, Lemon Juice, and Strawberries in a medium-sized mixing bowl. Stir mixture in a medium saucepan on medium heat until warmed. Increase to medium to high heat. Water will begin escaping the fruit. As liquid boils, foam will also form. Spoon foam into a separate bowl. Liquid will thicken. Continue stirring, scraping excess from the sides. Test for 'jelling' and remove. 'Jelling' Test: Remove plate from freezer and place 1/2 tsp of the liquid onto the plate. Allow to sit for a few seconds. 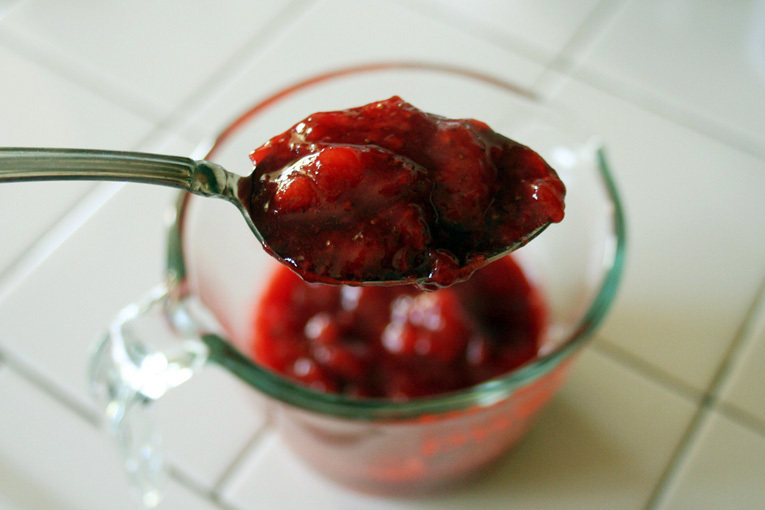 Run the spoon through the jam. If it tries to re-seal, continue stirring and heating for 1-2 more minutes and test again. 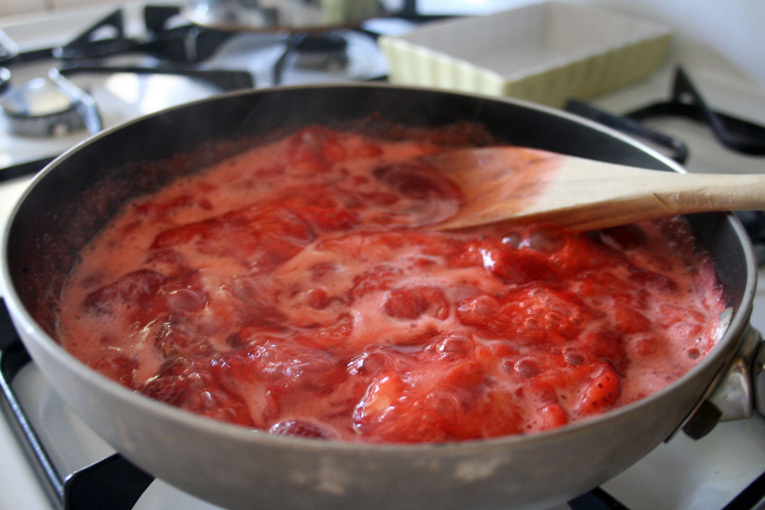 Jam will remain jelled on either side when ready to be removed from heat. 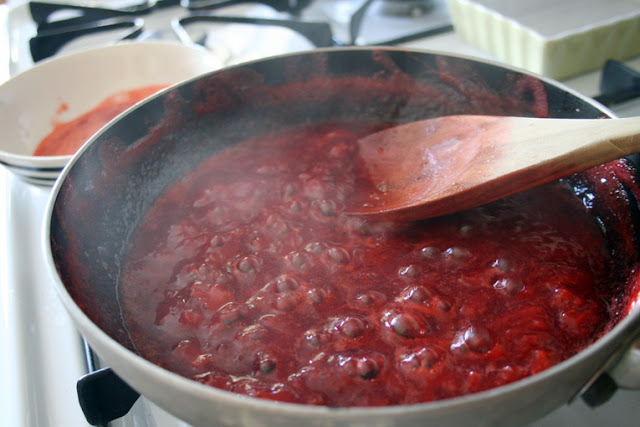 Please note: the jam will continue to thicken as it cools. It is a simple but delicious jam meant to go anywhere jellies and jams can go. 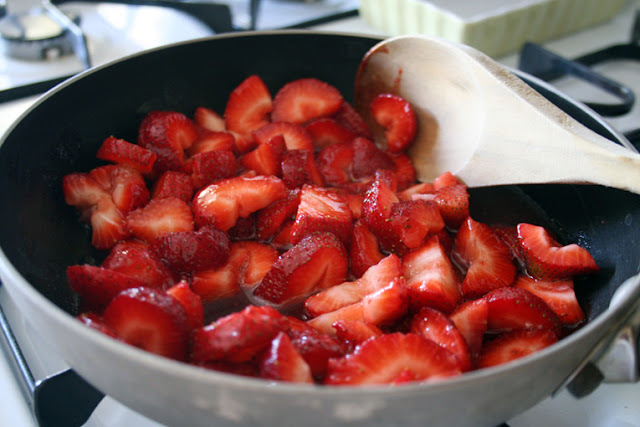 The recipe can be easily duplicated with other berries and fruit, but keep in mind that some hold more water which will change the cooking time and heat levels. Starting at a lower heat and building up to medium to high will help prevent overcooking and burning. If creative flavors are next on the list, adding a bit of fresh mint or spice to a jam concoction could add a twist and make a new favorite!